Any beer cans in there? A black bear went on a binge at a campsite in the US state of Washington - guzzling down some 36 cans of beer. Campground workers were stunned to come across the bear sleeping off the effects in their grounds, surrounded by dozens of empty beer cans. But this was no ordinary case of a bear with a sore head at Baker Lake resort, 80 miles (129km) northeast of Seattle. He had apparently tried out and rejected the mass-market Busch beer in favour of local brand Rainier. 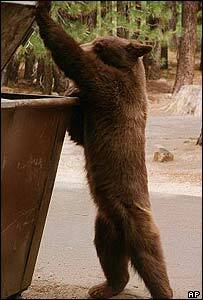 The bear appeared to have got into campers' cool boxes and used his teeth and claws to puncture the cans. Fish and wildlife enforcement Sgt Bill Heinck said the bear tried one can of Busch and ignored the rest - then got stuck into three dozen cans of Rainier. "We noticed a bear sleeping on the common lawn and wondered what was going on until we discovered that there were a lot of beer cans lying around," camp worker Lisa Broxson was quoted by Reuters news agency as saying. She said the bear was chased away by wildlife agents, but returned the next day. The agents decided to trap the bear with doughnuts, honey and, of course, two cans of Rainier beer. It did the trick and he was captured. "This is a new one on me," Sgt Heinck said in an Associated Press report. "I've known them to get into cans, but nothing like this. And it definitely had a preference."